Wow! What a wonderful turn out! I'm just about ready to close up this fundraiser and I am blown away by the support from the community. I have already received messages asking to be notified the next time I host this event because they would like to be a part of it! That makes this total = $954.45....and my grandparents want to donate the rest to bring the total up to $1000!!!! and, it is being matched by Borimoli Rocco! which will make this fundraiser $2000, and it ALL goes to finding a cure and better treatments for childhood cancer! Yesterday we raised $52, and since today is Saturday and busy busy in Downtown Redlands hopefully we'll raise even more! Sugar Me That did an absolute beautiful job on the cookies that were donated, they even sparkle! So, Today is the day. Come out eat some yummy treats, buy raffle tickets for great prizes (last year there were some seriously low entries), and support childhood cancer research. The total amount raised is $405 so far, I know it's a bit of a reach but if we raise $600 today with the match from Bormioli Rocco that will be increased to $2000 raised for Cookies For Kids' Cancer. Every $1 counts! Thanks again for everyone's help and support!!!! Oh my goodness! With Valentine's Day and the holiday weekend this event creeped up on me. Yesterday Sugar Me That confirmed a donation of 3 dozen cookies, and I know they are going to be awesome! She does the best work! Thank goodness for Facebook or I probably wouldn't have found her! There are a possible 2 dozen cookies coming from a new bakery in Yucaipa too! I'm so excited to have the extra help! Today I will be baking my heart out and packaging the raffle prizes!!! I'm really hoping this year is as big of a hit as last year :) Last year it was all rainy and cold, so this year the weather is perfect please come out and support us! You can find us Friday 2/21 and Saturday 2/22 from 11a-3p at Kissui Baby & Children. If I get a lot of people requesting we set up Sunday as well I will, but as of now it is just Friday and Saturday. Raffle Fun! Who Doesn't Like Winning a Raffle?!? So far I have a dance gift certificate from Dance Dimensions in Grand Terrace, 1/2 sheet of Jamberry Nails, 3 kids baskets filled with coloring goodies and more, there is a Trust the Bum basket on its way as well, and I'm working on a couple jewelry sets and hand painted glasses to put together. Raffle tickets can be purchased online at http://cookiesforkidscancer.kintera.org/stephanieansell each dollar donated will get you a raffle ticket.Some prizes are worth more than others so each prize will cost a different number of tickets to enter. For prizes worth less than $10 you will need 1 ticket to enter, $11-$20 you will need 5 tickets to enter, $21-$30 you will need 10 tickets to enter. If you have any questions I will be glad to answer! Just leave a comment here or email me, Stephanie, at ansell4387@gmail.com. This morning I spent some time sending messages to local bakeries trying to get baked goods donated for the bake sale, hopefully there will be some great responses! I've already gotten responses from Sucree (who helped out last year....yummy!) and Cucamonga Cakery Co. If you are or know of any bakers that would like to help out please contact me, Stephanie, at ansell4387@gmail.com! 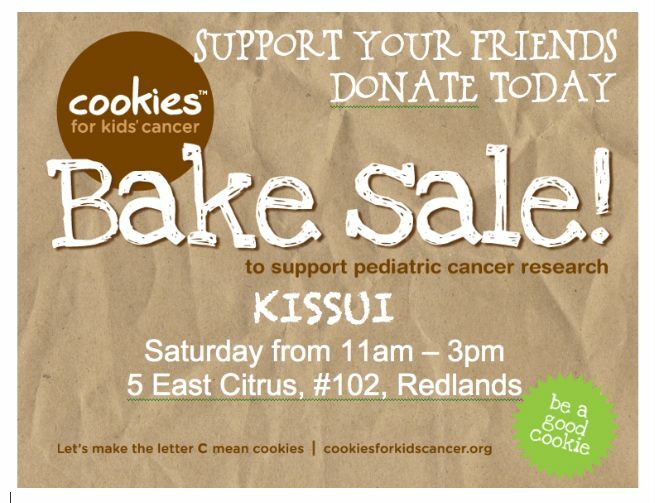 The weekend of February 21st-23rd I will be hosting (with tons of help from family and friends) my 2nd Bake Sale and Raffle event at Kissui in Downtown Redlands. Last year I threw the event together in a couple weeks and still (with the help of a match from https://www.facebook.com/BormioliRoccoUsa was able to raise $1500+. This year I know a little more about what I am doing so I'm hoping to bump that up to $2500! I can't do it alone though, I need your help! I have a location, now I need helping hands to donate baked goods and packaging, get the word out to their own friends and family, and donate items for the raffle. Please let me know what you would like to do to help me raise funds for pediatric cancer research by emailing me, Stephanie, at ansell4387@gmail.com Thank you so much in advance for helping make this year even more amazing than last year! I'm a stay at home mom with a passion for doing what I can for others <3 I honestly believe that if we all reach out with love and compassion the world will become a happier place.